REEL ZOMBIES: I Wonder Who The Real Schlockmeisters Are – Schlockmania! If you’re into modern horror fare, zombie films and found-footage films are inescapable parts of the terrain. There have even been crossovers of these two subgenres: Diary Of The Dead is probably the most notable but there were also two Zombie Diaries films. Reel Zombies takes this crossover to its logical end by adding comedy to the mix. Thankfully for horror fans, Reel Zombies favors satire over slapstick and uses its found footage/zombies element to create a pretty savvy and pointed satire of low-budget horror filmmaking. A look at the plot of Reel Zombies will reveal the filmmakers have thrown meta-storytelling into the mix, too: directors Mike Masters and David J. Francis are real-life low budget filmmakers who star as fictionalized versions of themselves. The story is mock-doc set in a world where the living dead have become a daily reality. Masters doesn’t want to give up his shoestring film-producing career so he pitches Francis on doing a zombie movie… with real zombies. Despite the ever-present zombie nuisance, Masters and Francis manage to gather up a gaggle of veteran schlock production people and actors new and old to make a film entitled “Zombie Night 3.” At first, the usual low-budget film hassles – a rushed schedule, lack of resources, disgruntled workers, arguing actors – are more of an obstacle than the zombies themselves. However, their mixture of over-ambitiousness and under-preparation catches up with them, leading to a darkly funny third act. 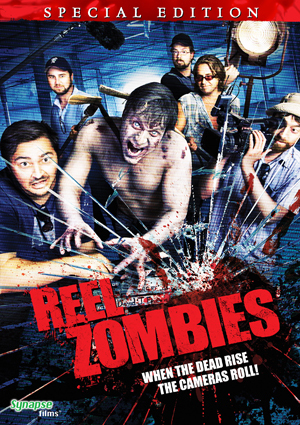 Reel Zombies is a lot of fun because it manages to satirize its milieu with a mixture of barbed observations and genuine affection for low-budget horror. Masters and Francis make the found-footage element tolerable because it used to humorous ends rather than as a cheap substitute for real filmmaking. They go for more of a deadpan humor rather than over-the-top mugging and slapstick and the presentation of what a low-budget horror set is like rings true because they’re drawing from genuine experience. The realism of their approach intensifies the humor and their handling of the third act pulls a nice switcheroo that shows they know their zombie horror tropes well. The acting is also surprisingly good for a micro-budget flick. Masters does a nice slow-burn as a filmmaker who knows he’s churning out hackwork while Francis creates a convincing portrait of a trash auteur whose enthusiasm is stronger than his talent or his common sense. The backing cast also includes witty turns from Sam Hall as an intensely bitter assistant producer and Paul Fler as a cynical would-be filmmaker who is shunted into the role of “transportation captain,” only to find the indignity intensified when he has to drive around a zombie. There’s even a brief but hilarious cameo from Troma honcho Lloyd Kaufman, who gleefully skewers his own persona. All in all, Reel Zombies is a true rarity – a horror comedy that is genuinely funny. Before you screen another found-footage horror or cut-rate zombie epic, watch this instead.